In a shallow dish, stir together grapefruit zest, juice, oil, garlic, oregano, salt and pepper. Add chicken and toss to coat well. Cover and refrigerate for at least 30 minutes or up to 4 hours. Yogurt Sauce: In a bowl, stir together yogurt, grapefruit juice, mint, garlic and salt. Cover and refrigerate. 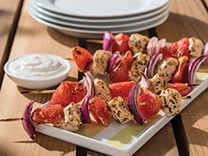 Skewer chicken and onion onto 8 soaked skewers and end each with a grapefruit wedge. Place on foil lined baking sheet. Roast in 425 F (220 C) oven for about 15 minutes or until golden and chicken is no longer pink inside. 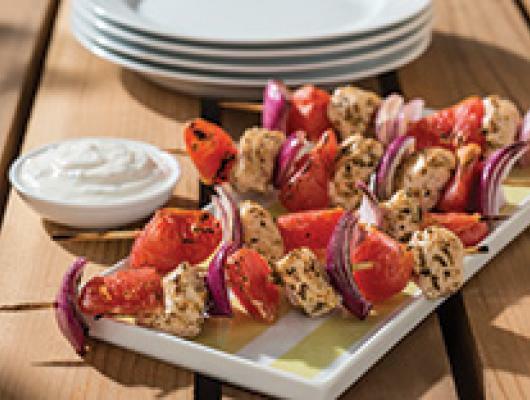 Serve with Yogurt Sauce. Adding unexpected sweetness to traditional savoury recipes is a simple and fast way to surprise your senses and enhance bold flavours.